COPYRIGHT NOTICE: Copyright © 2010 Thomas M. Achenbach, Research Center for Children, Youth, & Families, One South Prospect Street, Burlington, VT 05401, USA. All rights reserved. Use, duplication, or disclosure by the United States Government is subject to the restrictions set forth in DFARS 252.227-7013(c)(1)(ii) and FAR 52.227-19. You agree that ASEBA may revoke this permission at any time and that you shall immediately stop your activities related to this permission upon notice from ASEBA. The software that is made available to you via download is the copyrighted work of Thomas M. Achenbach and colleagues. The use of the software is governed by the terms and conditions of the end user license agreement that accompanies or is included in the software, or as expressly stated on the web site pages accompanying the software. An end user may not download or install the software without agreeing to the terms and conditions of the end-user license agreement. Any use or reproduction of the software in violation of the end user license agreement is expressly prohibited and may result in civil and criminal liability. E-mail address of designated agent: [email protected]. ASEBA has gained valuable rights by the proper and continuous usage of trademarks to identify its goods and services. If a trademark is used improperly, its value can become diluted or generic. Properly using our trademarks by following these trademark usage guidelines protects and preserves the value of our trademarks and the ASEBA brand.What a Trademark Means A trademark is a word, name, symbol, device, design, phrase, sound, or color adopted and used by ASEBA to identify its goods and services and to distinguish them from other goods and services. Trademarks are usually noted with either a ™ or a ® symbol. In the United States, a trademark that is noted by a ™ has not been registered with the United States Patent and Trademark Office and a trademark noted with an ® has been registered with the United States Patent and Trademark Office. Trademarks, however, may also be registered internationally and each country has different laws regarding the proper notation of trademarks. You adhere to these ASEBA Trademark Usage Guidelines. You do not disparage ASEBA products and services. You display your name or logo more prominently than any ASEBA trademark. You include a disclaimer that ASEBA does not sponsor, affiliate, or endorse your product and/or services. Use appropriate markings. Always capitalize the product name and designate the trademark with the appropriate ™ or ® symbol. The graphing capabilities of ASEBA Web are excellent. The graphing capabilities of ASEBA® Web™ are excellent. Also, the first usage or most prominent usage of an ASEBA product name must be used in conjunction with the ASEBA® trademark and in the same type size, font, color, and line. Do not use any ASEBA trademark as your trademark, service mark, trade name, domain name, product name, or logo.ASEBA trademarks identify the goods and services of ASEBA. No third-party may use any ASEBA trademark as his or her trademark, service mark, trade name, domain name, product name, or logo. You must have your own distinct trademark, service mark, trade name, domain name, product name, or logo that does not include any ASEBA trademarks. 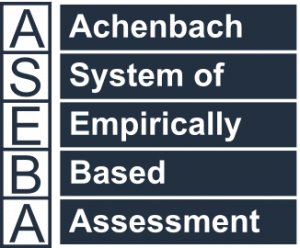 You may, however, referentially use the ASEBA trademark in connection with your product. Also, you may not use a variation, combination, or abbreviation of an ASEBA trademark. Attribute ownership of ASEBA trademarks to ASEBA. When you reference an ASEBA trademark, please include the following notice of trademark attribution where appropriate, such as on your product, printed materials, and online. ASEBA-PC and ASEBA-Web are trademarks or registered trademarks in the United States and/or other countries. Logos. You may not use any ASEBA logos (including buttons and graphic symbols) without a trademark license from ASEBA. All usage of trademark logos shall be pursuant to these guidelines and any other guidelines associated with those logos. Merchandise items. You may not manufacture, sell, or give away merchandise items, such as T-shirts and mugs, bearing ASEBA trademarks or logos, except pursuant to an express written trademark license from ASEBA. Slogans and taglines. You may not use or imitate an ASEBA slogan or tagline. Revised March 1, 2010This list is posted solely for your convenience. ASEBA does not waive any rights to any ASEBA trademark, service mark, trade name, product name, or logo that does not appear on this list. The symbols below denote status of the trademark in the United States only. ASEBA trademarks may also be registered internationally. Should you, or any viewer of this information, web site, or publications respond with information, feedback, data, questions, comments, suggestions, or the like, any such response shall be deemed not to be confidential. ASEBA shall be free to reproduce, use, disclose, and distribute the response to others, without limitation. You agree that ASEBA shall be free to use any ideas, concepts or techniques contained in your response for any purpose whatsoever including, but not limited to, developing, manufacturing, and marketing products incorporating such ideas, concepts, or techniques. EXCEPT AS EXPRESSLY PROVIDED OTHERWISE IN AN AGREEMENT BETWEEN YOU AND ASEBA, NEITHER ASEBA NOR ANY THIRD PARTY HAS CONFERRED UPON YOU BY IMPLICATION, ESTOPPEL OR OTHERWISE, ANY LICENSE OR RIGHT UNDER ANY PATENT, TRADEMARK, OR COPYRIGHT. EXCEPT AS EXPRESSLY PROVIDED OTHERWISE IN AN AGREEMENT BETWEEN YOU AND ASEBA, ALL INFORMATION, SOFTWARE, THE WEB SITE, AND PUBLICATIONS ARE PROVIDED “AS IS” WITHOUT WARRANTY OF ANY KIND, AND ASEBA HEREBY DISCLAIMS ALL WARRANTIES EITHER EXPRESSED OR IMPLIED, INCLUDING, BUT NOT LIMITED TO, IMPLIED WARRANTIES OF MERCHANTABILITY OR FITNESS FOR A PARTICULAR PURPOSE. IN ADDITION, ASEBA DISCLAIMS ANY WARRANTIES OF NON-INFRINGEMENT, TITLE, OR QUIET ENJOYMENT. IN NO EVENT WILL ASEBA BE LIABLE FOR ANY SPECIAL, INDIRECT, OR CONSEQUENTIAL DAMAGES, OR ANY DAMAGES WHATSOEVER RESULTING FROM THE LOSS OF USE, DATA OR PROFITS, WHETHER IN AN ACTION FOR BREACH OF CONTRACT OR WARRANTY OR TORT (INCLUDING NEGLIGENCE) ARISING OUT OF OR IN CONNECTION WITH THE INFORMATION, SOFTWARE, THE WEB SITE, OR THE PUBLICATIONS. YOU ASSUME ALL RISKS CONCERNING THE SUITABILITY AND ACCURACY OF THE INFORMATION WITHIN THE WEB SITE AND PUBLICATIONS. THE WEB SITE AND PUBLICATIONS MAY CONTAIN TECHNICAL INACCURACIES OR TYPOGRAPHICAL ERRORS. ASEBA ASSUMES NO RESPONSIBILITY FOR AND DISCLAIMS ALL LIABILITY FOR ANY SUCH INACCURACIES, ERRORS, OR OMISSIONS IN THE WEB SITE AND PUBLICATIONS AND IN ANY OTHER REFERENCED OR LINKED DOCUMENTS. ASEBA MAY MAKE CHANGES TO THE INFORMATION, SOFTWARE, WEB SITE, PUBLICATIONS, PRICES, TECHNICAL SPECIFICATIONS, AND PRODUCT OFFERINGS AT ANY TIME AND WITHOUT NOTICE. THE WEB SITE AND PUBLICATIONS ARE DISTRIBUTED INTERNATIONALLY AND MAY CONTAIN REFERENCES TO ASEBA PRODUCTS, PROGRAMS, AND SERVICES THAT HAVE NOT BEEN ANNOUNCED IN YOUR COUNTRY. THESE REFERENCES DO NOT IMPLY THAT ASEBA INTENDS TO ANNOUNCE SUCH PRODUCTS, PROGRAMS, OR SERVICES IN YOUR COUNTRY. THE WEB SITE MAY CONTAIN LINKS TO THIRD-PARTY SITES THAT ARE NOT UNDER THE CONTROL OF ASEBA AND ASEBA IS NOT RESPONSIBLE FOR THE CONTENT ON ANY LINKED SITE. IF YOU ACCESS A THIRD-PARTY SITE FROM THIS WEB SITE, THEN YOU DO SO AT YOUR OWN RISK. ASEBA PROVIDES THESE LINKS ONLY AS A CONVENIENCE AND THE INCLUSION OF THE LINK DOES NOT IMPLY THAT ASEBA ENDORSES OR ACCEPTS ANY RESPONSIBILITY FOR THE CONTENT ON THOSE THIRD-PARTY SITES.